Pioneers in the industry, we offer dissolved oxygen portable meters, dissolved oxygen meter, dissolved oxygen meter - hi 2400 and dissolved oxygen handheld and bench meters from India. 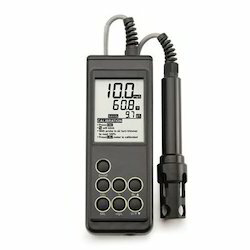 Dissolved Oxygen Portable Meters are a water-resistant, dissolved oxygen meter that measures up to 300% saturation or 45 ppm (mg/L) with temperature compensation and automatic calibration. It has been developed for DO and temperature measurement in water, waste water, and applications such as fish farming. On-screen tutorial messages Two point calibration Auto endpoint DO range up to 300%, temperature compensated. Altitude compensation up to 4000 m, Salinity compensation up to 80 g/L Automatic calibration in air. GLP features, Low battery indicator. 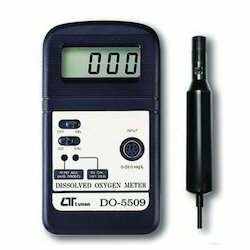 We offer Dissolved Oxygen Meter. Its give an indication of the biodegradable organic material present in a sample of water. The dissolved oxygen concentration is measured before and after an incubation period of 5 days and the BOD is calculated in mg per liter from the difference. OUR and SOUR are used to determine the oxygen consumption or respiration rate. OUR is measured in mg of oxygen consumed per liter per hour, and SOUR is measured in mg of oxygen consumed per gram of volatile suspended solids per hour. 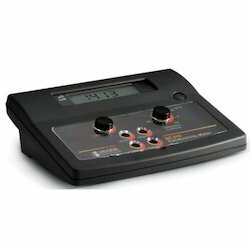 Dissolved Oxygen Meter for Laboratories HI 2400. HI 7041S electrolyte solution (30 ML), power adapter and instructions. We are one of the noted manufacturers, traders and suppliers of Dissolved Oxygen Handheld/Bench Meters. These are the metering equipment for measuring the diffussion of oxygen in water. Bench meters are suitable for testing pharmaceutical, food products and drinking water for dissolved oxygen contents. Our D.O. handheld/bench meters are designed strictly in conformity to the national quality standard to make precise measurement. 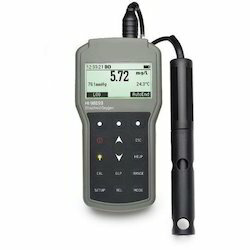 Looking for Dissolved Oxygen Handheld and Bench Meters ?